James R. Dougherty, a partner at Whitt Law, LLC, concentrates his practice in the areas of property tax and assessment litigation, school district related litigation, general commercial litigation, insurance coverage litigation, construction litigation, financial services litigation, and employment litigation, as well as professional liability and product liability matters. He has tried cases in Illinois State and Federal courts and before the Illinois Property Tax Appeal Board. In addition, he has represented clients before the Illinois Appellate Court and United States Court of Appeals for the Seventh Circuit. Mr. Dougherty has obtained multimillion dollar judgments on behalf of his clients in numerous cases and several venues including Cook, DuPage, and Kendall Counties. He has also successfully defended high exposure cases throughout Illinois and acted as national counsel in such cases pending throughout the country. In the course of his practice, Mr. Dougherty has represented clients in cases pending in Illinois, New York, California, Delaware, Wisconsin, Louisiana, Virginia, Massachusetts, Pennsylvania, Michigan, Hawaii, Tennessee, New Mexico, Ohio, Florida, New Jersey, Kentucky, Oregon, South Carolina, Texas, Indiana, Oklahoma, Maryland, Alabama, Rhode Island, Montana, and the Cayman Islands. Mr. Dougherty also routinely provides counsel to various insured and self-insured entities regarding risk management and litigation related issues, and has defended insured and self-insured entities including school districts, railroads, and private business organizations against a variety of actions. 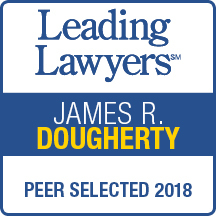 Mr. Dougherty is highly regarded in the Illinois legal community as evidenced by his selection to the 2012, 2013, 2014, 2015, and 2016 Illinois Super Lawyers Rising Stars list, published by Thomson Reuters. Selection to the Rising Stars list is based upon peer review and is limited to only 2.5% of Illinois lawyers meeting the criteria for selection. Additionally, Mr. Dougherty has been named an “Emerging Lawyer” for 2015, 2016, 2017, and a “Leading Lawyer” for 2018 in the area of commercial litigation by Law Bulletin Publishing Company’s “Leading Lawyers” division. This is a distinction earned by fewer than 5% of all attorneys licensed to practice law in Illinois. Attorneys selected for these honors were recommended by the state’s top lawyers as those most likely to lead the profession in future years. In addition to representing clients throughout Illinois, Mr. Dougherty devotes a portion of his time each year to public service by serving as President and Trustee of the Mill Creek Water Reclamation District, which provides potable water and sanitary sewer disposal services for thousands of homes, numerous businesses, and several schools within Kane County. Prior to joining Whitt Law, LLC, Mr. Dougherty was a litigation associate with a New York-based international law firm and a senior attorney with a Chicago-based national law firm.